The spooky Halloween season is a great time to enjoy a good mystery book. October is the time when I cozy up on the sofa with a cup of coffee, listen to the rain and wind, and enjoy a great holiday-themed mystery book. I actually save a pile of books for this time of the year. "Halloween Night, 1954. A young, film-obsessed scriptwriter has just been hired at one of the great studios. An anonymous investigation leads from the giant Maximus Films backlot to an eerie graveyard separated from the studio by a single wall. There he makes a terrifying discovery that thrusts him into a maelstrom of intrigue and mystery -- and into the dizzy exhilaration of the movie industry at the height of its glittering power." --Publisher description. Devils in the Mirror by Lesley Horton. Detective Inspector John Handford mysteries. "It is almost midnight on Halloween. Firefighters following up a fourth hoax call to a local beauty spot discover the body of Shayla Richards, a young black girl. DI John and Handford and DS Khalid Ali soon discover that Shayla's past is anything but straightforward… Yet events take a more sinister turn when Handford discovers his prime suspect seems to be a man without a past. In fact, he doesn't even seem to exist..."--Back cover. Hallowe'en party: a Hercule Poirot mystery by Agatha Christie. Hercule Poirot mystery. "At a Hallowe'en party, Joyce -- a hostile thirteen-year-old -- boasts that she once witnessed a murder. When no one believes her, she storms off home. But within hours her body is found, still in the house, drowned in an apple-bobbing tub. The next day, Hercule Poirot is called in to investigate. But first he must establish whether he is looking for a murderer or a double-murderer..."--Back cover. Vampires, Bones and Treacle Scones by Kaitlyn Dunnett. Liss MacCrimmon mysteries. “Halloween is approaching and newlywed Liss MacCrimmon Ruskin is tapped by the Moosetookalook Small Business Association to organize a community fundraiser. Liss throws herself into plans to turn an abandoned mansion into a "haunted house." And then, to Liss' horror, the fake skeleton she's acquired for a special effect is replaced with a real body -- and it's someone she knows”. Blackwork by Monica Ferris. Needlecraft mysteries. "It's Halloween - and Betsy Devonshire, owner of the Crewel World needlework shop and part-time sleuth, is haunted by murder. In the town of Excelsior, Minnesota, Leona Cunningham, owner of a popular microbrewery, is a practitioner of Wicca, the nature-based religion often mistaken for black magic. Then, after one too many pints, a local blames Leona for the series of 'accidents' that have happened throughout town. When he ends up dead without a mark on his body, Leona's the main suspect." --Fantastic Fiction website. Stirring the plot by Daryl Wood Gerber. 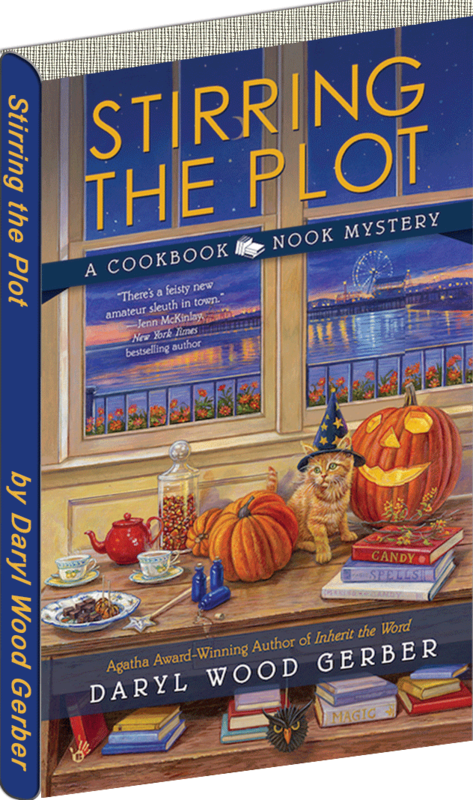 Cookbook Nook mystery. "Halloween in Crystal Cove, California, is a big deal, involving a spooky soiree where the Winsome Witches, a fund-raising group, gather to open up their purse strings and trade superstitions. But party magicians, fortune-tellers, and herbalists are only the beginning of this recipe for disaster... When the Head Priestess of the Winsome Witches is found dead under mysterious circumstances, there's no logical answer and plenty of blame to go around." --Back cover. The Immortals by J.T. Ellison. A Taylor Jackson novel. 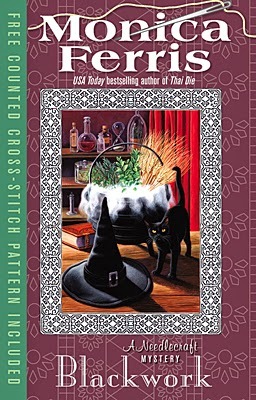 Witches' Bane by Susan Wittig Albert. China Bayles mysteries. Antiques Maul by Barbara Allan. Trash 'n' treasure mystery. A Roux of Revenge by Connie Archer. Soup lover's mystery. "Snowflake, Vermont, is known for its skiing in winter-- and its soup all year round, thanks to Lucky Jamieson's 'By the Spoonful.' Autumn brings golden leaves, pumpkin rice soup, the annual Harvest Festival... and murder." --Back cover.